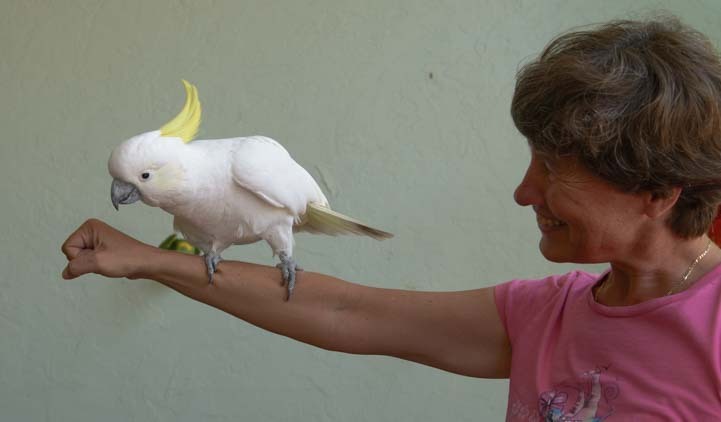 Jungle Gardens in Sarasota Florida - It's for the Birds! 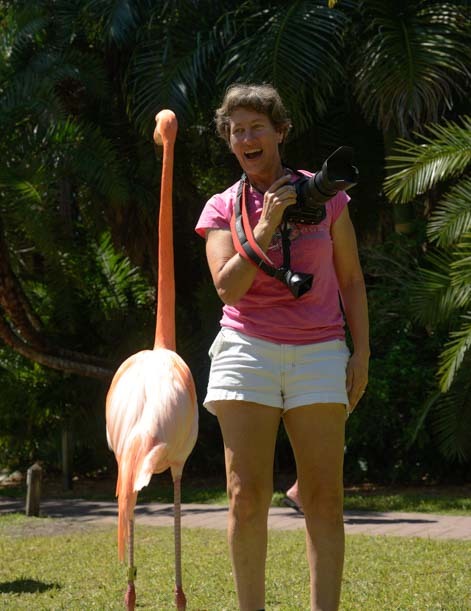 Jungle Gardens in Sarasota Florida – It’s for the Birds! April, 2015 – A vacation to Florida wouldn’t be complete without a trip to a tropical garden with exotic birds, and even though we weren’t exactly “on vacation” (well, maybe this was a “vacation from our vacation” ?? 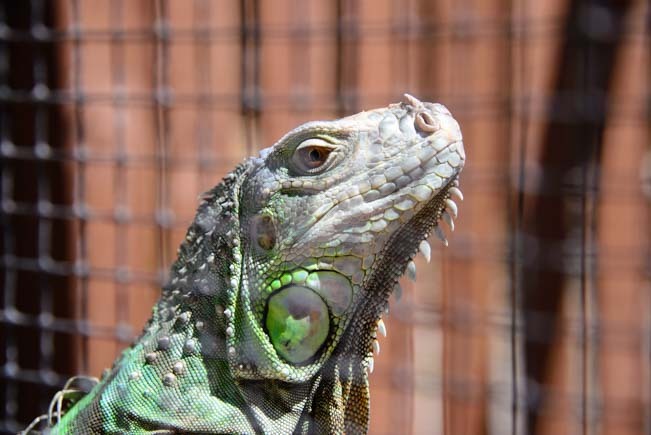 ), during our stay in Sarasota we just had to go to Jungle Gardens. Zoo trips to kiddie parks may seem to be all alike and not really appropriate for the 50+ set if you don’t have grandkids in tow, but this place held some special treats for us. 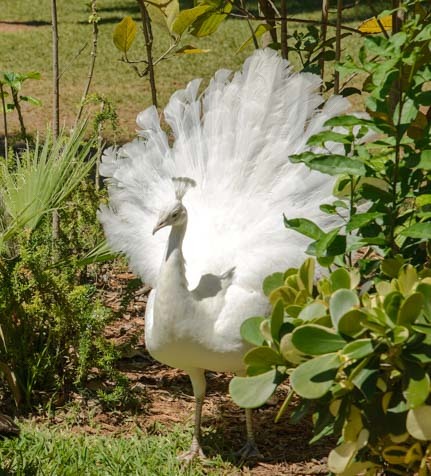 When we arrived, we were greeted by a beautiful albino peacock who looked like a princess ballerina emerging from the bushes. The flamingos were nearby, walking all around us, and we watched them vie with the seagulls for the free food handouts that people were grabbing from little dispensers around the grounds. 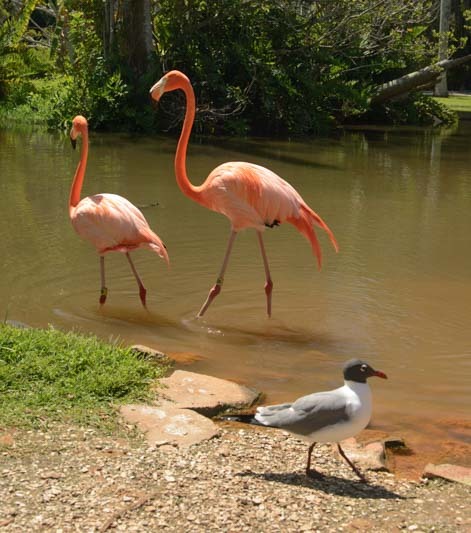 The food is for the flamingos but the seagulls don’t miss a trick. 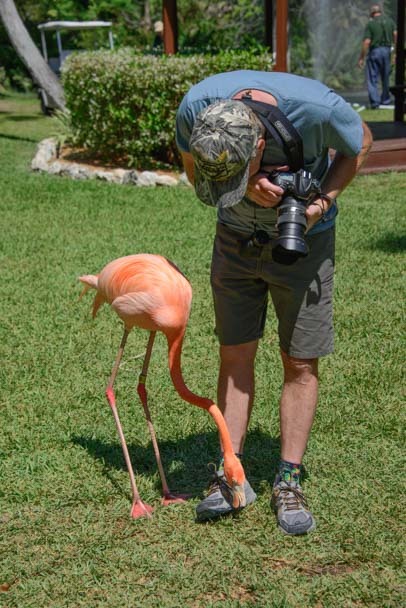 I’d never stood next to a flamingo before, and I was quite surprised — these guys are really tall! One came over and suddenly became very interested in Mark’s shoes. 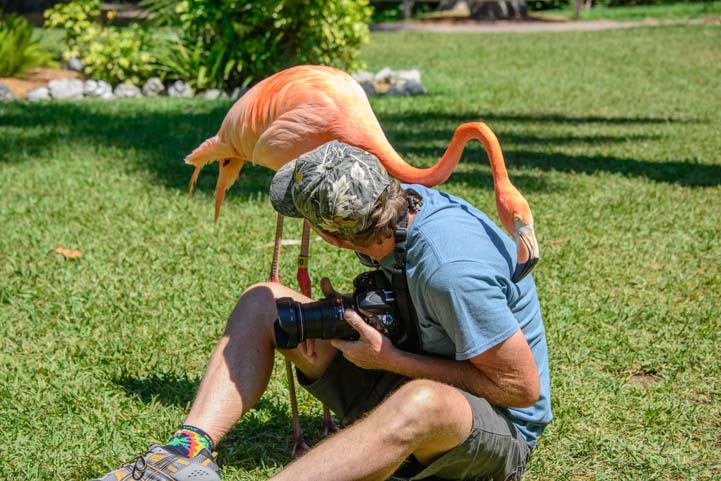 I looked away, and when I looked again, Mark had squatted down to take some photos and this flamingo had marched right over to him and was resting his chin on Mark’s head! 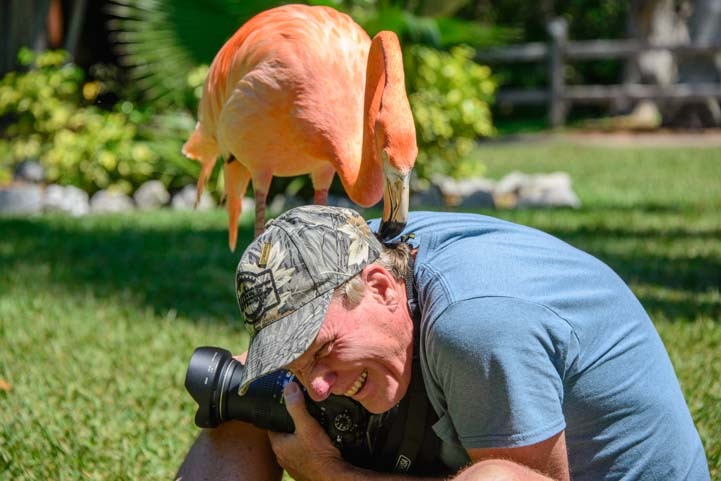 Then this big pink creature got really interested in something on Mark’s neck. Mark turned towards him, and he just kept on poking around, rubbing his beak all over Mark’s back. Crazy bird!! What’s he looking for anyway?! 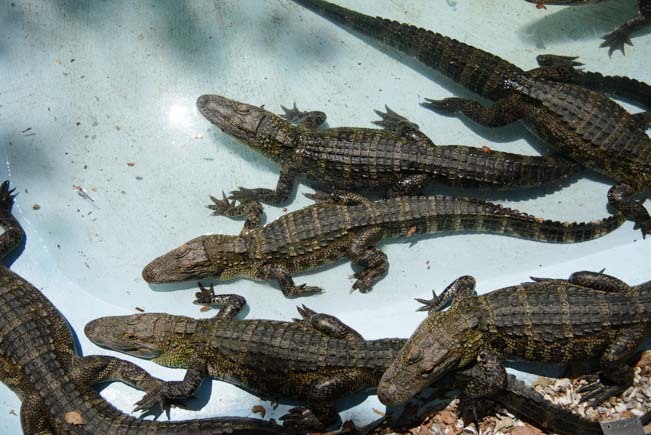 …and an allligator pen nearby. Wait til these guys grow up! This is a “garden” and we saw some lovely plants. 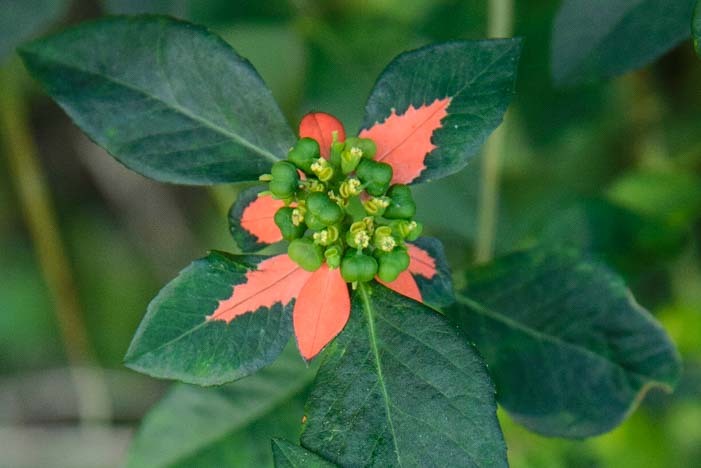 I especially liked the red and green leaves on a bush Mark found. Despite all these animals, it is a Garden, after all! But it was the birds that charmed us the most. 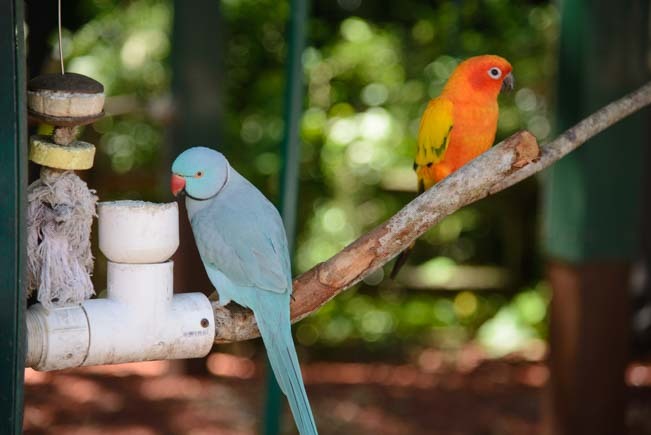 There is a big group of parrots at Jungle Gardens, and they come in all colors, from light blue to bright orange. Pretty colors: a ring neck parakeet and a conure. 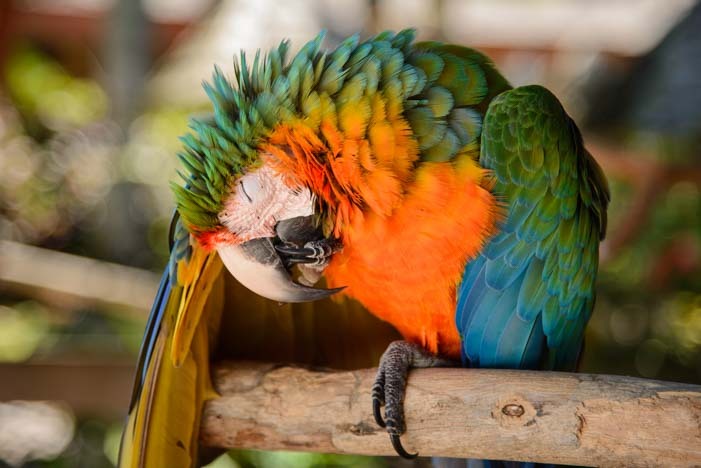 Some colors are even “made up” like this hybrid of a green wing macaw (which is red and green) and a blue and gold macaw (which is blue and yellow). The result — orange and green and blue! What do you get when you cross red and green and blue and yellow? But my favorite parrot of all is Snowflake. 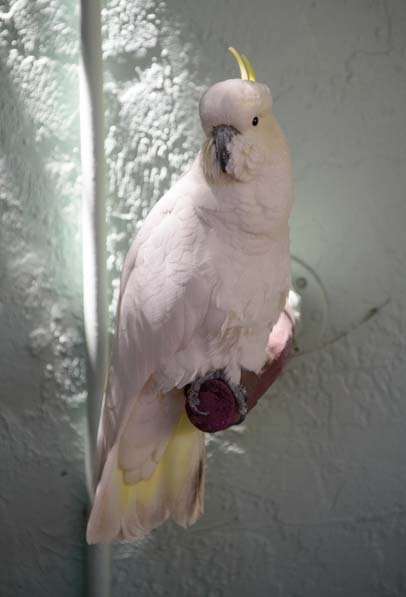 He’s a greater sulphur crested cockatoo that is 79 years old. And if you look at him closely, you can’t tell that he’s a day over 3. He’s in perfect shape. The star of the show — at 79. There’s a very fun bird show at Jungle Gardens, and we watched two Macaws, Andy and Cracker, doing the ring toss. Cracker and Andy do the ring toss while a buddy looks on. Then the trainer introduced Snowflake to do his tricks. We were amazed when she told us he had performed on the Ed Sullivan Show. He rode a unicycle on TV for Ed Sullivan — and he did the same trick for us! One of the macaws got a ride on a swing underneath him as he pedaled across a tightrope. How cool is that?! He’s been performing every day for decades. What a champ! Snowflake takes a buddy for a ride. 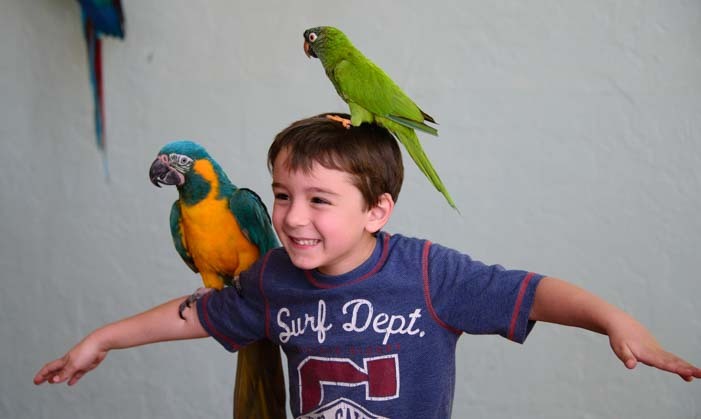 Afterwards all the kids lined up to get their photos taken with the birds of their choice on their heads and arms. I was the only person over 10 standing in line to get my pic taken with a bird on my arm, but Mark nudged me and said he’d take a photo of me with Snowflake. My day was made!! Holding a 79 year old bird makes me feel like a kid! 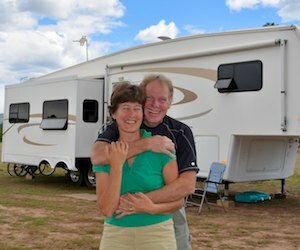 This entry was posted in Florida and tagged Florida, New, Sarasota Florida, Travel, USA, WP Travel by Roads Less Traveled. Bookmark the permalink. Fabulous adventure. My kind of place. Would love to hang out with those birds myself:) You guys look like you are having so much fun. Good thing you both have cameras to catch what is going on with the both of you. fun! It was a ball, Rose, and having the cameras with us to catch all the crazy stuff with the birds made it even better!!! I’m glad you enjoyed them, Terry! 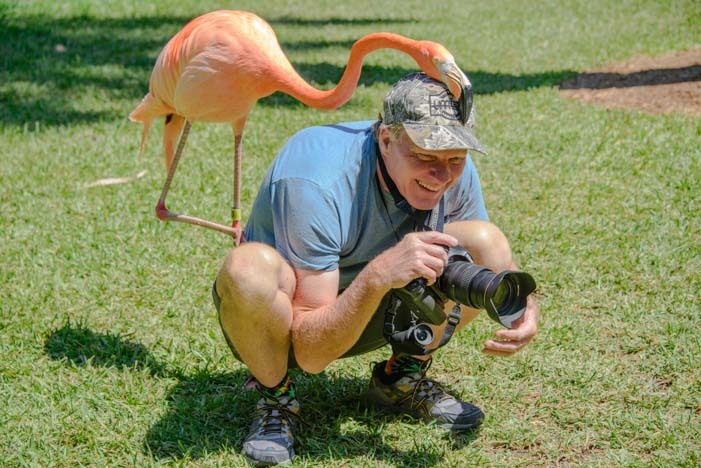 Ahhh “flamingo love” – those were great shots and I think I would have a blast at that place as well!!! As long as I could go when there weren’t throngs of children and people. It’s a really fun place, Sherry, and there weren’t throngs of people (in April…). “Flamingo love” is a very special kind of love!! !